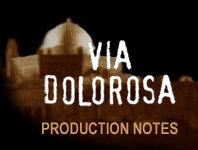 Because Via Dolorosa is a monologue, the look and feel of the production is spare and untheatrical. Hare enters on a thin plank bridge to a stage built over an abyss. According to designer Ian MacNeil, the bridge highlights the precariousness of David's position, "He is acting for the first time, dealing with such a controversial topic." The only dramatic effects are the lighting, some sounds of Gaza and a model of the Jerusalem skyline that appears when Hare walks the Via Dolorosa, the path that Christ walked to his crucifixion. The designer's aim was to make everything feel natural. The stage was just a place where David Hare would relate what he had observed-- it needed elements to make the monologue dramatic, but it couldn't compete with the realistic nature of the performance. In London, MacNeil says he was lucky enough to have a romantic crumbly Victorian theater. It was a natural place for a first-time actor to come out and tell his story. 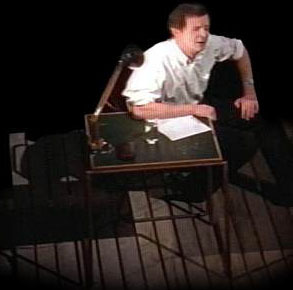 But when the play moved to the Booth Theater in New York, MacNeil had to create an "undressed" stage. Hare later described the result as a "superb piece of trickery. Ian's beautiful pipework snakes across the empty stage and charges the whole stage with the romantic spirit of old Broadway." The lighting director was Rick Fisher. Hare described the lighting as similarly heightening the play's dramatic elements without a hint of artifice: "When you are on stage the light seems soupy and general; you have no sense of its focus, because you are the thing it is focused upon. But its movement is reassuring, and quickly creates a sense-memory, where you can feel an individual line being carved into shape by the movement of the lamps around you. It's a lovely feeling when it's right. Rick is a great fan of side light, which is naturally sculptural. Actors generally hate side light because it means that when they look at each other the lights are shining right in their eyes. But as I never look sideways, I'm happy as a clam." For more on the set design, read the interview with Ian MacNeil.